What is there not to love about Laverne Cox? From her passion for trans visibility and LGBTQ rights as a whole to her humility when she's garnered award show nominations in the past, Cox is nothing short of the kind of role model the world's needed for far too long. And Laverne Cox at the 2015 Emmys? Well, you better believe her radiance, talent, confidence, body positivism, and killer sartorial tastes shone through. Cox has come to the Sept. 19 awards, no doubt, to celebrate her Orange Is The New Black family as they await to find out whether they'll be taking the Emmy for Outstanding Drama Series home. It's a special night for many, to say the least, so her ensemble kind of feels like a metaphorical gesture (or maybe I'm just poetic like that). At the 2015 Emmys, Cox is wearing a fitted, floor-length Calvin Klein gown in a beautiful teal. Never one to fear taking risks with fashion (hello plunging, tuxedo-style jumpsuit at the 2015 BET Awards), Cox has opted for something glamorous yet funky — two characteristics I certainly always associate with her OITNB character Sophia. What's so great about this look is that it feels so tied to her bold personality yet so fitting for the event (not an easy feat to accomplish). 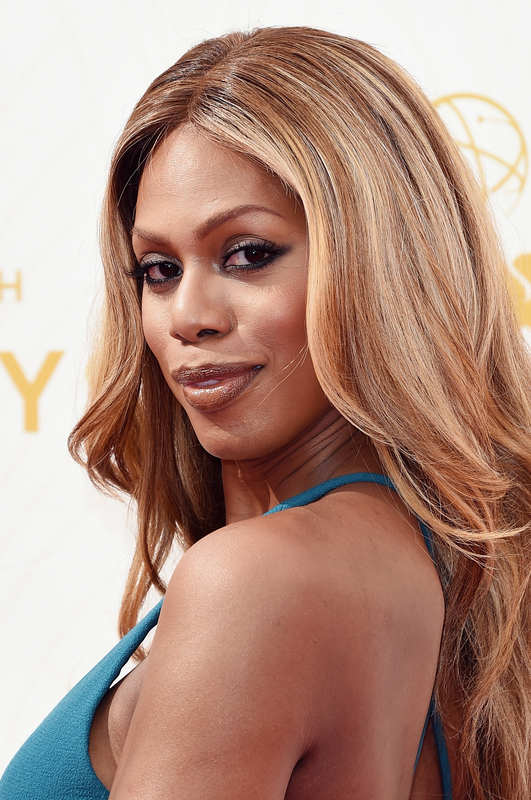 Caitlyn Jenner said it best: Laverne Cox looks and is "iconic." When the transgender activists met in July 2015, it was nothing short of a historic moment for the trans and LGBTQ community as a whole. Jenner's support for Cox tonight is simply beautiful. Much like that impeccable teal gown and its perfectly placed side and back cut-outs.